I have been reading a lot of Jane Austen lately. I realized that I hadn't read anything of hers since I was probably too young to appreciate it fully, so I'm making her work my summer project. 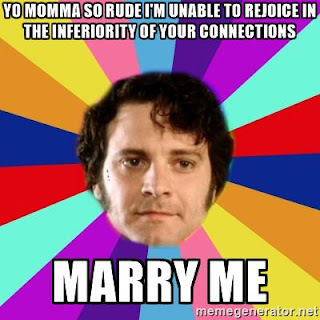 And I've gotta say, my favorite thing about this experience so far has been realizing what an adorable, awkward goofus Mr. Darcy is. Like, not even including his very abrupt style of proposing (the first time, anyway). He is just constantly blushing and standing around watching Elizabeth like a weirdo. What a precious little cinnamon roll he is. Anyway, I definitely have a brand new appreciation for just how well Jane Austen wrote her characters. They are subtle and clever and often very funny! I feel like she is very ignored in high schools, and I think that's a shame. I think that there's a lot that can be learned from her books, especially about what it was like to be a woman when she was alive. I'm so sad that I didn't appreciate her sooner.